We know you will enjoy this gallery celebrating the many amazing achievements of our children for the fantastic variety of activities they undertake outside of school. Luke was offered a place in the Birmingham City Academy under 8s team last year and has played against lots of academy teams from a number of big clubs. Over the Easter holiday he will go on tour to Bournemouth. Amazing stuff Luke ! Well done to Luke. He was awarded player of the match by his coach. He has been playing for the Black Country Cobras for some time now and really enjoys football! Congratulations to Shayana who has passed her 3rd grade at Judo and is now 3rd Mon! Keep up the hard work! We are all proud of you! Wow - Amber won three different rosettes and certificates for performing a variety of dances at her dance school. Great stuff! Madison achieved her yellow belt tag in Tae-Kwon-do by performing her pattern. Well done Madison! Angel has achieved her Octopus 2 award for performing a range of fabulous swimming skills. Good job Angel! Well done to Kayan. He had to perform a range of swimming skills to achieve his Angelfish 1 award. Congratulations to Vanshika and Aum, our Animal Carer Stars. They have both overcome their fear of chickens. Well done! March 2019 Well done Rosie - what a fantastic achievement passing Level 6 Gymnastics ! March 2019 Sienna was awarded her certificate at dance for winning the improvisation dance category. Well done! March 2019 Layla was awarded her certificate at dance for winning the improvisation dance category. Congratulations! March 2019 Kelsie has achieved a bronze award for her fantastic freestyle dancing. Super effort Kelsie! Jessica won her trophies and rosettes at dance competitions. Congratulations! March 2019 Maddie, Harry and Leila are our latest Animal Carer stars. They are doing a tremendous job. Well done! 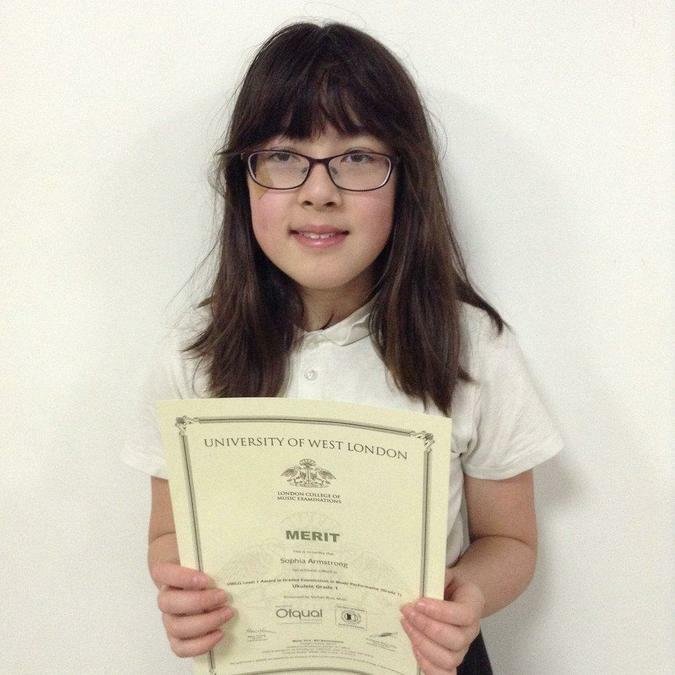 Ettie-May won 3rd place as part of a trio competition performance at her dance school. Great effort Ettie-May! March 2019 We're impressed with Sheoli - she received a Blue Peter badge for making a canvas picture which the Blue Peter team thought was terrific and also passed her Grade 2 ballet exam. Congratulations Sheoli, keep up the hard work! Well done to Shayana for being awarded with a Blue Peter badge! She made an amazing collage of the Blue Peter ship at sea which Blue Peter thought was fantastic! We're all very proud of you! 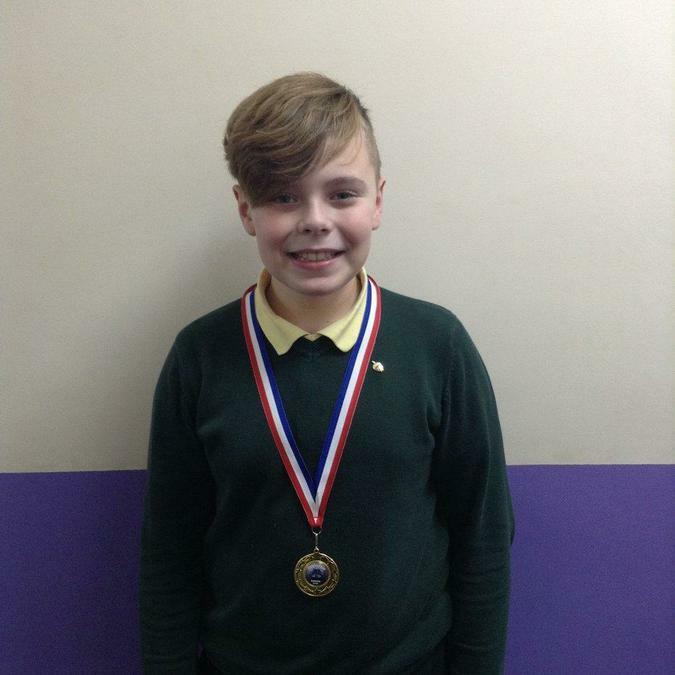 March 2019 Shewan won a Blue Peter Badge for his amazing achievement of climbing Scafell Pike. What a superb effort, well done Shewan! March 2019 Leighton, Noah and Joe are our first Animal Carer Stars of the Week. Well done boys for your hard work and kindness towards the animals. Keep it up! February 2019 Tia was awarded a trophy for being a great goalkeeper at the Albion soccer camp. What a star! Amelia received her Rainbow badge for swimming 200 metres. Well done Amelia! Amber received the Star Award for completing the RSPB Big Garden Bird Watch. Keep up the good work Amber! Paige was awarded her Goldfish 1 certificate. She had to swim various strokes and answer swim safety questions. Congratulations! Ella took part in the 'Do Your Thing' dance competition, she came 2nd in the Duo's section. Well done Ella! Layla was awarded her medal for taking part in the Cannon Dance Festival. Well done! Well done to Lacey who has passed Goldfish 3. She had to swim 15 metres on her back and 10 metres holding a float. Keep up the good work Lacey! Belle achieved 3rd place in a duo and group dance and received this trophy and medal. Congratulations Belle! February 2019 Lexie received a trophy and medal for achieving 3rd place in a duo and group dance, as well as a trophy for placing 4th in her solo dance. Well done! Albion trophy for taking part and being kind, polite and helpful at soccer camp. What a star! 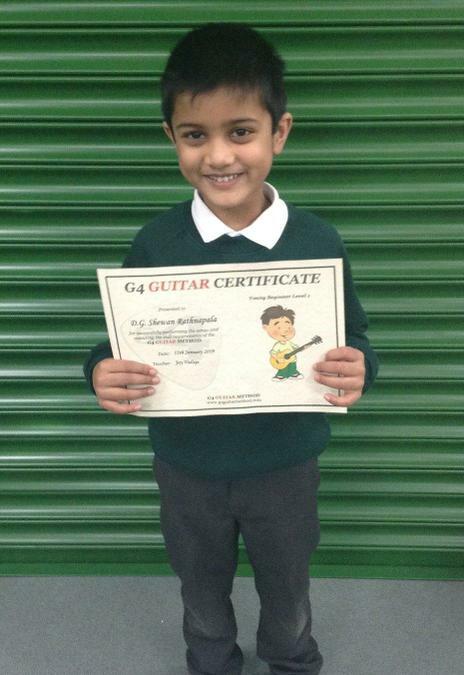 February 2019 Shewan received this certificate for performing songs successfully and executing skills for G4 Guitar. Well done Shewan! 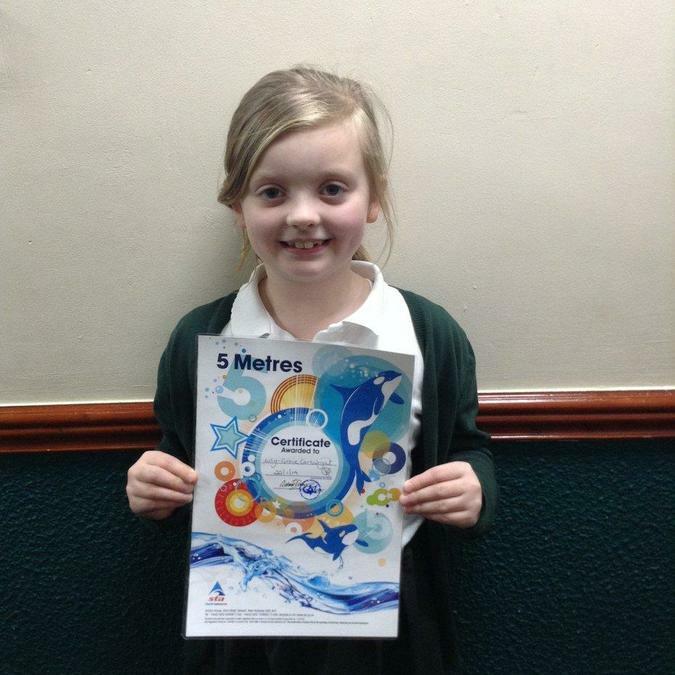 January 2019 Lily achieved her certificate for swimming 5 metres unaided. Congratulations Lily. January 2019 Sophia has achieved Grade 1. She had to play lots of different songs and play the different chords carefully. Well done. Harry received this medal for outstanding effort and skills at his boxing club. Well done! 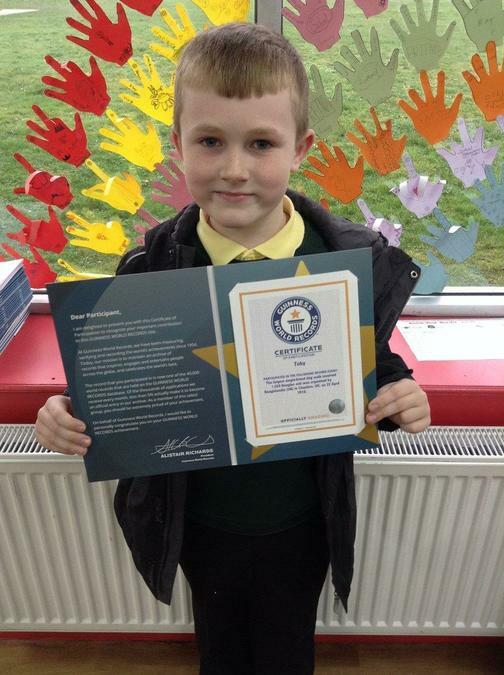 We have a Guinness World Record holder in our School! Recently, Callum, his family and his dog participated in the largest Beagle meet to date. There were 1,029 Beagles involved! What a special day this must have been! 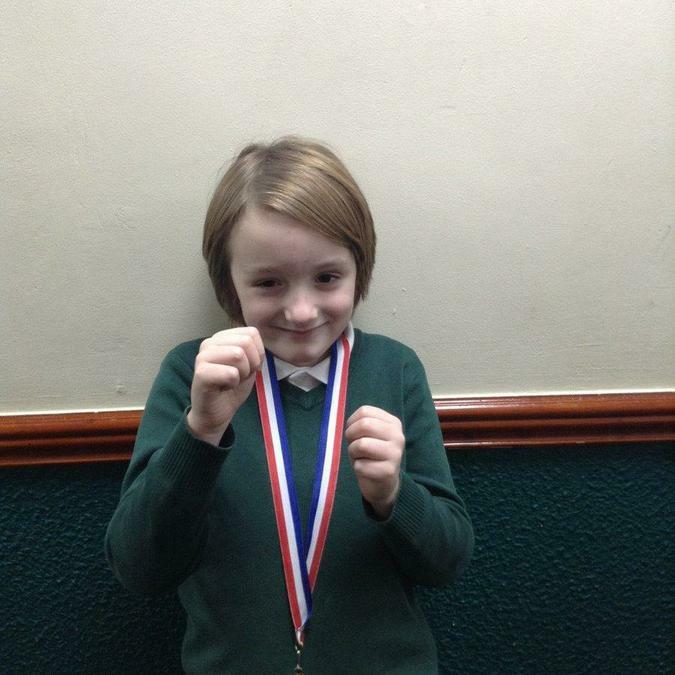 Ralph was awarded his medal for his great effort and dedication at his boxing club. Congratulations!